There is no easy way to make small changes to the CSS of your Prestashop site. You can use a FTP client and navigate to the proper file, if you can figure out which file it is in. If you do that though, the changes will be erases when you update your shop or your theme. This module takes care of that problem. You can edit the CSS and the changes will not be erased when you upgrade your theme or your shop or even if you change themes. 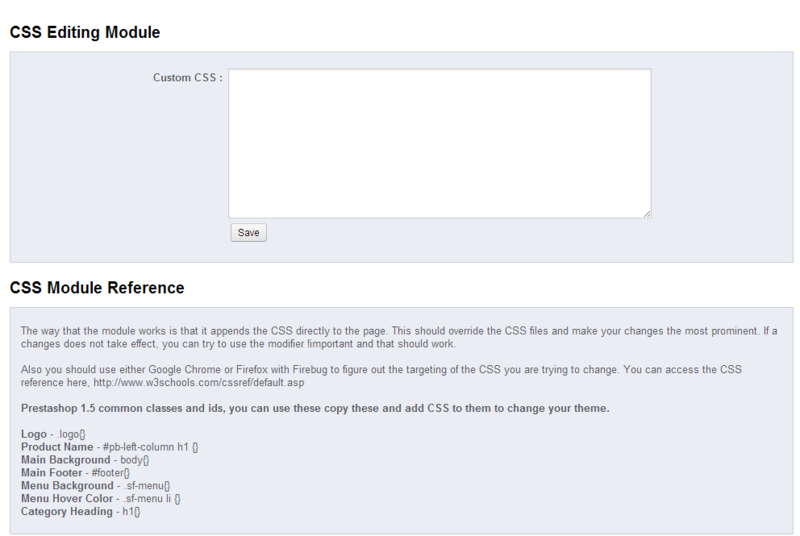 The module is on a basic level an area where you can enter custom CSS. If you do not know CSS, it is relatively simple to learn and can help you set your Prestashop website apart from every other shop online. With this module you can adjust background colors, font-sizes, fonts, just about any thing visually on your Prestashop store can be accomplished with CSS.